Editor’s Note: On Friday night, a presentation ceremony was held in center ring at Freedom Hall during which the following ASHA scholarship recipients were recognized. Since 1991, the American Saddlebred Horse Association has awarded several yearly scholarships to young students involved with the Saddlebred industry as a means to fulfill one of ASHA's principle missions - the education and encouragement of youths. These scholarships are presented to individuals who are members of the ASHA, have completed grade 11, are under age 21 and who best meet the qualifications of financial need, commitment to the American Saddlebred, ASHA youth programs, and academic success. While many recipients of this scholarship may plan to pursue a career within the horse industry, this is not a prerequisite for scholarship application. Rather, applicants are simply rewarded and recognized for the favorable light they have cast upon the Saddlebred breed - within the show ring, their schools and their communities. In 2006, five ASHA Scholarships each of $5,000 will be awarded. Including the 2006 awards, the total amount of money awarded to date in ASHA Scholarships will exceed $200,000, given to more than 90 ASHA junior members in more than 21 states. Lowry Simone Lovell comes from a family that has a rich history in the Saddlebred industry. At 18 years old, she is already a great contribution to this legacy and has had many opportunities riding and showing all her life. She has been a counselor at summer camps for Cash Lovell Stables and is currently an instructor for Heritage Farm teaching about 20 students. Simone founded and acted as president of the Lovell's Lil Bits Youth Club and is an active member of ASAC Juniors. Education is very important in the Lovell family and Simone has excelled in that area as well. She took mostly honors classes and worked on the yearbook staff, which piqued an interest in journalism. She achieved several honors during her high school years including being a member of the National Honor Society for three years and holding the position of treasurer. She was also a member of the National French Honor Society, Key Club and on the Charity Ball Planning Committee and was on the Who's Who Among American High School Students. Still, she found time to tutor sixth grade students in math, clean an elderly couple’s home weekly and volunteer at horse shows. After teaching her first riding lesson, she realized that is what she wanted to do with her life. She also knew there was more to teaching than just the love of the sport, so she will be attending the University of North Carolina at Chapel Hill where she will study Business Administration with a concentration in Marketing. Ashley Moore was taught “To play hard, you need to work hard,” and that is exactly what she does. Besides the usual high school workload, she was a band member through her senior year. She was a French student for five semesters and had one semester of College in the Schools. Ashley started riding lessons six years ago after accompanying a neighbor to their lesson. Since then she has progressed from showing in academy to owning her own show horse. She won the Three-Gaited 16-17 year old class at the 2005 World's Championship Horse Show in Louisville, Kentucky, competing against twenty of the top riders in the country. She was nominated for the Frank Ogletree award, which is an award for sportsmanship, ethics, and accomplishments. She was voted on by her peers to be the 2005 Peoples’ Choice Award recipient that recognizes individuals and horses who light up the show ring making them the crowd favorite. She was also the 2005 Top Ten Champion in Saddle Horse Report's high point program that recognizes horses and riders that show and win all year. She was the recipient of the Tri-State Horseman’s Association Laura Sedgewick Award in 2002 and 2003, which is based on community service, participation in the horse industry, leadership skills, and concern for others. She is also rewarded every time she helps students in the We Can Ride program accomplish their own amazing goals. Ashley has volunteered with this therapeutic horseback and carriage-driving program for children and adults with disabilities since 2001 as a leader or side walker. She has also helped with the fund raising auction for this organization. Not only has she made a difference in the lives of the students, but has also learned patience and dedication for herself. This fall, Ashley will attend Wake Forest University in North Carolina and has already made arrangements to ride with a Saddlebred barn in the area. Work Hard-Play Hard!!! John is a 2004 graduate of Pike View High School now attending the University of Tennessee majoring in architecture. He has always had the strong will to succeed. At an early age he wanted to ride Saddlebreds with his mom. His parents, Ralph and Shirley Trail, have a horse farm where John spent time as a child and now in his spare time and summers, helping with the family business, working horses, giving riding lessons and just keeping the rest of the farm going. He also dedicates time around his class schedule and educational activities to help with and attend various horse shows in the area. In the tenth grade he tore the ACL ligament in his knee. Not being able to ride, he changed divisions and began showing in Fine Harness classes. It was during this time that he placed sixth in the American Saddlebred Horse Association Foundation Youth Driving Challenge Finals at the World's Championship Horse Show in Louisville, Kentucky. In addition to his dedication to the horses, he applies the same to his education. He took advanced classes in high school, was accepted into the National Honor Society and was always in the top ten percent of his class. This strong will has also followed him into college life where he is still in the top ten percent of his class. At the end of his first semester of college, he was inducted into the Phi Eta Sigma National Honors Society, an achievement only about six percent of college freshmen attain. Besides being a member of the American Saddlebred Horse Association, John is a member of the West Virginia Horseman's Association, Appalachian Horseman Association, United States Equestrian Federation, and is a board member of the ASHB Futurity of West Virginia. We are proud to award this scholarship to this young man who displays such dedication and commitment to both horses and academics. The American Saddlebred has always been an important part of Christina's life. Her first "horse" was a burro she talked her aunt into adopting from a Rescue. When she was old enough, she started taking riding and driving lessons and has been showing ever since at Impossible Dream Farm. She has shown for years, graduating from the academy levels into the performance division. She was so excited to ride, and anxious to learn everything about the American Saddlebred, she completed the American Saddlebred Horse Association's "Saddle Time" program in less than a year. During the summers, she lived in the barn; literally, slept in the tack room, as she was the lead counselor at the summer youth camps. She then decided to share her love for the American Saddlebred by starting a youth club. As the club president for three years, she organized the meetings, field trips and horse shows for the group. She is also very active with Jr. ASHAG, a former vice president of the club and on the Mid Summer Charity Horse Show committee. She was also responsible for the Jr. ASHAG scrapbook. Christina was the recipient of the Sportsmanship Choice Award and the Juvenile Choice Awards. Christina is an all-round animal lover. She is a member of and donates numerous hours to the Jack Russell Rescue, Wild Horse and Burro Rescue and P.E.T.A. (People for the Ethical Treatment of Animals). When in middle school she found another love rival to that of horses. She joined the school band and fell in love with the French horn, which led to four more instruments that she plays as well. She was a field commander for a year and a section commander for three years in the South Cobb High School Band. Since then she has shuffled honors classes, music lessons, riding lessons and is still able to keep up working with the humane societies and animal rescues which she has been doing now for seven years. She has received many honors for her work with the concert and symphonic bands, orchestras, woodwind quintet, jazz band, District Honor Band and UGA bands. She also founded the school's history club, joined the chess, French, Latin and Model UN units, which allowed her to travel and represent her school. Though she may be headed to Jacksonville State University to major in music, Saddlebreds will continue to be a very important part of her life. 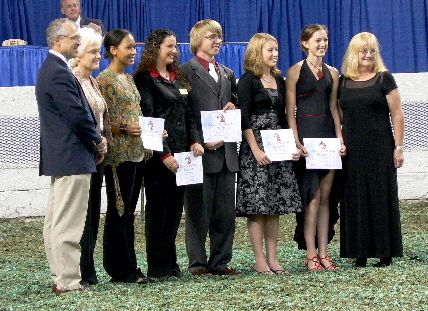 The ASHA Youth-to-Youth Scholarship is an award given annually to an individual who has participated in ASHA Youth Activities, including Youth Conference, Youth Clubs, Saddle Time, Academy Awards, Junior Judging, ASHA Driving Challenge, American Saddlebred International Youth Program (ASIYP) Levels, ASIYP Letters, and ASIYP Competitions. Recipients have shown initiative in broadening their knowledge of horses beyond the confines of the show ring and exhibited a commitment to well-rounded horsemanship. They are considered role models for the younger members of their barns, youth clubs, and schools. Lisa began riding and learning about the American Saddlebred eleven years ago, wishing for a “heart-of-gold” horse that she could ride to a World’s Championship. She would draw pictures, make cloth rosettes and even practice a big gaping victory pass grin in the mirror. However, no number of stitches she made or reflections in the mirror changed the fact that her family could not afford the financial obligations of owning a show horse. She was told, "If you want a nice horse, you will have to work hard in school and get a good job when you are older that allows you to own one." Now at age 18, we feel she has exceeded what they had in mind when they said "work hard in school." Throughout all four years of high school, she has maintained a perfect grade point average taking advanced courses. Among the many scholastic activities and honors she received, she also demonstrates leadership qualities. She was the National Honor Society president, math team secretary, Editor-In-Chief of the school newspaper, French club president and vice-president, Cross Country Varsity captain and on the student council, just to name a few. Between studying and school activities came the one true love that prompted all this hard work: horses. She began riding and working at Woodhaven Stables. She had shown academy since age six and felt prepared to move up to the next level. She was offered the chance to show one of the horses owned by her employer's private stable, Red Flower Farm. Before she could even show in the first class he was injured and out for the season – but Lisa did not give up. She continued working and taking lessons. In 2004 with enthusiastic permission from the owners, she founded and was president of their youth club, the Woodhaven Whippersnappers Youth Club. She has been on the ASHA National Youth Conference Planning Committee, involved with the ASIYP program and Junior Judging competitions and is currently working on an idea she has for a Saddlebred pen pal exchange to promote the breed across regions. Since 2000, she has been writing a column for the "Junior Exhibitor Jumble" section of Saddle & Bridle magazine. Last year she wrote a young adult Saddlebred novel that has been accepted for publication this spring. She sees this as an opportunity to reach out to those currently not involved with the breed and share the majesty and athleticism of the Saddlebred. She has developed a very strong work ethic, dedication to achieving goals and is a great example for leadership. Lisa is on her way to owning her own show horse. It is with this great dedication to promoting the breed and being such a positive role model among her peers that we are so excited to award her the Youth-to-Youth scholarship.